"What Comes After the Retiree Drug Subsidy," Benefits Quarterly, 3rd Quarter, Vol. 22, Num. 3, 2006. "Attesting to the Value of Employer Plans," Contingencies, July/August 2005. 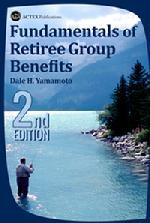 "Retiree Health Care Benefits: Strategies for a Changing Workforce," Benefits Quarterly, Fourth Quarter, 1998. "Retiree Medical Transfers After GATT," Journal of Pension Benefits, Fall 1995. "Should You Self-Fund?" Managing Employee Health Benefits, Fall 1992.